They are unaffected by most violent thermal shocks. They resist perfectly to almost all corrosive fluids used in industry, in particular to those which attack aluminium, silicate materials (hydrofluoric acid, boiling hydrochloric acid and hot caustics). They are perfectly wetted by all liquids (aqueous solutions, molten salts, etc) and ensure, therefore, maximum efficiency at envisaged operation. Carbon Raschig rings have one third the weight of metal tower packings. They have a crushing strength of 600 kg/cm2 and negligible porosity. Caustic scrubbers – Merox units , in Isomerisation units for MSP ( EURO -III) for Refineries. Ethyl alcohol ( Sulphuric alkylation) stripping towers. 70% sulphuric acid 15% HF pre-scrubbing towers. Carbon dioxide absorption towers with M. E. A. High temp. weak sulphuric HCl wash towers. 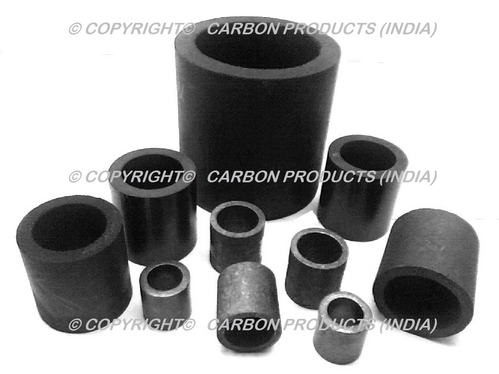 We are a quality oriented company which offers products like Carbon seals, Carbon rings, Graphite bushings, Carbon bushings, Carbon raschig rings, Graphite pads, Graphite blocks, Graphite Impellers, Graphite rotors, Graphite tubes, Graphite casing, Carbon bearings etc. We use the finest raw material that is procured from reliable sources after rigorous testing of various parameters. We have a quality management team that makes sure that all the production processes are carried out flawlessly. Our transparent and timely deals have fetched us a wide client base that is spread across the world.